cubatravel has been a member since February 27th 2014, and has created 10 posts from scratch. Isla de La Juventud or, Island of Youth, as it was named in the 1970s due to its favored location for summer youth camps is a sleepy island unlike mainland Cuba. Nueva Gerona is the capital of the island and could be described as the only place that constitutes anything remotely resembling a town. The city was founded in 1830 by Francisco Dionisio Vives, who was the Spanish governor of Cuba at the time. Oddly enough there is an American graveyard in Nueva Gerona to this day which is popular with Cuban Americans and those studying ancestry. Nueva Gerona is a busy and relatively prosperous town with the small but colorful streets having more of a provincial Latin American flair than the distinctly Cuban feel of the mainland. Many of the visiting African students who study on the Island of Youth are based in Nueva Gerona giving the town a more cosmopolitan atmosphere than most other towns and cities outside Havana. Also they contribute towards the island’s citrus fruit industry. Parque Central on Calle 39 is the place where many of Nueva Gerona’s young congregate. At weekends it is also home to some excellent live salsa and, if you are visiting the city, this is a good place to start; it is also home to the local tourist information office and to most of the town’s cafes and restaurants. Hotel Villa Isla de la Juventud is situated next to the idyllic Las Casas River, in a calm rustic setting, and it is harmonically coupled to the surrounding picturesque landscape. Very Near the capital city of Isla de la Juventud, Nueva Gerona, the resort offers a raised pool with excellent views of the surrounding landscape plus well appointed rooms. This is a good choice for couples, singles and families looking for a budget hotel on the Island of Youth. This hotel Villa, in a peaceful, picturesque setting, offers you recreational activities, excursions, trips of places of historic interest (such as the “Model” Prison) and evening entertainment in its cabaret bar. The sunset by the pool is another must for guests. Hotel Isla de la Juventud Villa is about one mile southeast of Nuevo Gerona, amidst woody grounds on the eastern bank of the River Las Casas (a suspension bridge leads across the river). The 20 air-conditioned and spacious bedrooms are in enclosed two-story blocks, each comprising of four units. Although rooms were recently refurbished to serve foreign tourists, they’re still only functional, with simple rattan decor. Our booking process is unique because it shows the best rate from all of these for Villa hotel in Isla de La Juventud and the types of rooms available. Our Villa Isla de La Juventud rate comparison is an industry first for Cuban Hotels. Once you’ve compared the rates, finalizing the booking at Villa Hotel takes just seconds and an immediate confirmation is provided in real-time. Welcome to the Hotel El Colony located in the bay of Siguanea, Isla de La Juventud, just 45 minutes away from Nueva Gerona airport which itself is just 35 minutes from Havana by airplane. Within one hour of leaving Havana you could be walking on the beach at our Hotel. The spacious and sun-lit, but sparsely furnished lobby is enlivened by lime-green lounge chairs and has a small general store. This colorful hotel dates back to 1958, when it began life as a Hilton Hotel quipped with a casino. The El Colony Hotel is situated on a heavenly coral-colored beach of fine sand. Isla de La Juventud, also called “the island of a thousand names” due to the many names it has had since Christopher Columbus discovered it, at which time he named it La Evangelista. The Indians called it Camargo, Guanaja and Siguanea. Governor Diego Velázquez called it simply “Santiago”. Others have called it Treasure Island (because it was where Robert Louis Stevenson set his famous novel); Cotorras (Parrot) Island, because of the abundance of parrots here; and, more recently the Isle of Pines. In the 1970s, because of the many schools in the countryside that were built here, its name was officially changed to Isle of Youth. It is the second largest island in the Cuban archipelago (2,357 square km. – 910 square miles). Its many attractions include the Punta Francés National Marine Park, Bibijagua Beach, the Los Indios-San Felipe Natural Preserve, the pictographs in Punta del Este caves, the Colony International Scuba-Diving Center, El Abra Farm and the “Model” Prison. Guests at Hotel El Colony can benefit from the facilities offered by the International Diving Centre which gives access to some of the world’s best dive sites. For more details please visit the El Colony International Scuba Diving Centre or the Hotel El Colony websites. The 77 air-conditioned guest rooms and 24 bungalows have cool white tiles underfoot. All have satellite TV plus telephones. By day, guests can partake of various water sports, and cars can be rented for forays further afield. The nightlife is low-key, and the hotel is too far (about 45 kilometers) from Nueva Gerona to make a nocturnal sojourn a possibility. Our booking process is unique because it shows the best rate from all of these for El Colony hotel in Isla de La Juventud and the types of rooms available. Our El Colony Isla de La Juventud rate comparison is an industry first for Cuban Hotels. Once you’ve compared the rates, finalizing the booking at El Colony Hotel takes just seconds and an immediate confirmation is provided in real-time. The Rancho El Tesoro Villa is located in a tranquil setting, and it is harmonically linked to the surrounding picturesque landscape. The accommodation is popular among anglers, but it’s definitely a nice option for visitors on their way to the International Diving Center El Colony in the west and right next to the city of Nueva Gerona. Adorned with fake ramparts like a colonial fortification and painted in a strange red hue, Rancho El Tesoro looks more like a castle than a Hotel. Actually it was a popular of chateau in the 1950s. In the midst of a rich and abundant nature, in a quiet serene setting, a North American had constructed its holiday home in the vicinity of the River Las Casas. The rooms arranged for relatives and lodgers, now host international tourism, although on a relatively small scale. Book a night in this hotel after your arrival at the airport of Nueva Gerona and explore other sites of the undiscovered Isle of Youth. The north- eastern beach “Playa Bibijagua” is known for its black volcanic sand. The former prison (Presidio Modelo), to where the attackers of Moncada barracks (1953) were sent, is now a national monument. 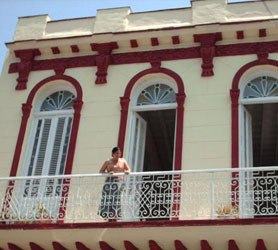 Similarly, La Finca El Abra, where the young José Martí was confined is now a Cuban memorial museum. Rancho el Tesoro is a quaint accommodation with onsite facilities such as a bar, restaurant and lobby. Our booking process is unique because it shows the best rate from all of these for Rancho Tesoro hotel in Isla de La Juventud and the types of rooms available. Our Rancho Tesoro Isla de La Juventud rate comparison is an industry first for Cuban Hotels. Once you’ve compared the rates, finalizing the booking at Rancho Tesoro Hotel takes just seconds and an immediate confirmation is provided in real-time. A Casa Particular in Isla de la Juventud or home stay on Isla de la Juventud will ensure you experience both the wonders of Isla de la Juventud’s amazing culture, immersed in one-on-one contact with your Cuban hosts. Learn about Isla de la Juventud’s rich history, together with true Cuban hospitality. The owners of your casa particular in Isla de la Juventud speak fluent English and have a profound knowledge of the city and its many sights. Any questions you wish to ask will be answered instantly by the Cuban family you are staying with. Some of our casa particulares also offer meals and drinks, meaning you’ll get to try some authentic Cuban food also.